POMEROY, Samuel Clarke, a Senator from Kansas; born in Southampton, Mass., January 3, 1816; attended Amherst College, Massachusetts, 1836-1838; moved to New York State in 1838 and taught school; returned to Southampton, Mass., in 1842; held various local offices; member, State house of representatives 1852-1853; organizer and financial agent of the New England Emigrant Aid Co.; moved to Kansas in 1854 and settled in Lawrence; moved to Atchison, Kans. ; mayor of Atchison 1858-1859; member of the free State convention at Lawrence in 1859; president of the relief committee during the famine in Kansas in 1860 and 1861; upon the admission of Kansas as a State into the Union was elected as a Republican to the United States Senate; reelected in 1867 and served from April 4, 1861, to March 3, 1873; unsuccessful candidate for reelection in 1872; chairman, Committee on Public Lands (Thirty-ninth through Forty-second Congresses); resided in Washington, D.C., for several years; died in Whitinsville, Worcester County, Mass., August 27, 1891; interment in Forest Hills Cemetery, Boston, Mass. American National Biography; Dictionary of American Biography; Gambone, Joseph. 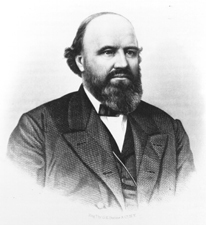 Samuel C. Pomeroy and the Senatorial Election of 1861, Reconsidered. Kansas Historical Quarterly 37 (Spring 1971): 15-32; Kitzhaber, Albert. "Gotterdammerung in Topeka: The Downfall of Senator Pomeroy." Kansas Historical Quarterly 18 (August 1950): 243-78.